Quantitative analysis of taphocoenoses allows the recognition of dominants and codominants of the main associations and reconstruction of the taph, i.e., simplified skeletal structure of the lower units of the paleocatena, which is a reconstructed sequence of benthic communities on the slope of a sedimentary basin (Zakharov and Shurygin, 1985; Krassilov, 2003). Only aquatic and riparian associations are connected with the lithological characteristics of the taphocoenosis. The composition of zootaphocoenoses allows the hydrological mode of basins to be determined. The frequency ratio of basin and lowland associations is determined by the watering of the bottom of valleys and depressions. The frequency ratio of lowland and slope associations is determined by the ripeness of valleys. The frequency ratio of herbaceous and arborescent slope associations is determined by the ruggedness of terrain adjacent to the basin. Original Russian Text © G.N. 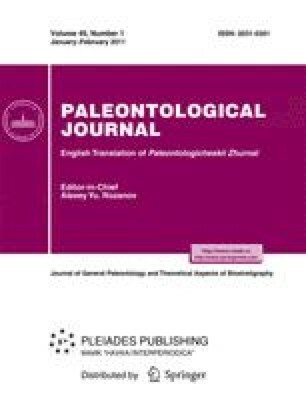 Sadovnikov, 2011, published in Paleontologicheskii Zhurnal, 2011, No. 1, pp. 97–104.